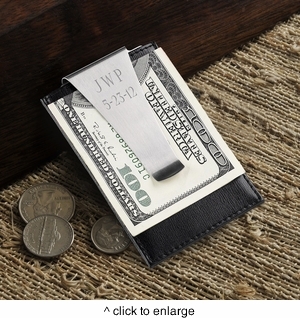 DETAILS: Tuck your tens and twenties into this fashionable Personalized Leather Money Clip! This personalized top-grain leather accessory includes plenty of space for both bills and credit cards and includes a no-slip clip to hold everything in place. Available in Classic Black. SIZE: Measures 3 7/8" x 2 5/8". PERSONALIZATION: Personalize with 2 lines up to 8 characters per line. MARKETING: Money clips, gifts for him, Father's Day gifts, groomsmen gifts, executive gifts.